A fellow peer helped me with the idea to draw this cartoon around “eek-ak.” The joke..a Brain-ee-ack. I want to give special THANKS to my peer who goes by the handle Peahen8 for Brainstorming with me for a funny idea for another cartoon for Brain Awareness Week! Once I had the punch line, drawing the cartoon was a bit tricky. With a few sketches I plotted out the joke, but one character seemed to be insulting the other. So that’s when Eeyore jumped into my head and door-to-door self-deprecation. No, I am not saying IF you are a “Brainiac” you must live with Bipolar Disorder. Rather, many peers living with Bipolar Disorder have some amazingly wonderful, awesomely ideas that we start and may never finish them all. It is an inside joke to my fellow peers, like me, living with Bipolar Disorder (and their loved ones/caregivers) who star tons of projects, but have bigger and better ones to do before that one is done. Normally, while going through a full on manic or hypomanic state. Bipolar disorder (“manic depression”) is a mental disorder that is characterized by constantly changing moods between depression and mania. Discover if your symptoms are similar to those for bipolar disorder, also known as manic depression. This scientific quiz provides instant results. Bipolar disorder can be effectively treated with medication and psychotherapy. With proper treatment, individuals with bipolar can lead fulfilling, productive. Bipolar disorder affects about 2 million people in the United States in any given year. Both men and women are affected at the same rate. Candida Fink, M.D. 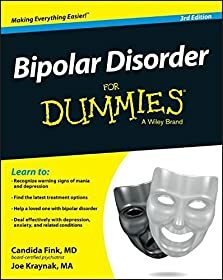 and Joe Kraynak are authors of Bipolar Disorder for Dummies. Ultimately, I'm A Maggot But Can I Have A Higher Purpose?